I’m well aware that the title of this book will raise some eyebrows. I’ll admit it took me off guard at first too. Thankfully, knowing who wrote it, I knew what was inside was worth getting past my own preconceived notions of the word “feminist”. When I opened it up I unearthed treasures of grace, beauty and substance. This went far beyond expectations into a place in my soul that surprised even me. It was a place of strengthening my own faith that went beyond my own beliefs. The writing in this book had the prose Sarah’s readers have come to know. It’s full of the raw, honest, gutsy stories of a woman who has an intimate relationship with her Saviour. She speaks of Jesus with a love that only comes from knowing Him intimately. 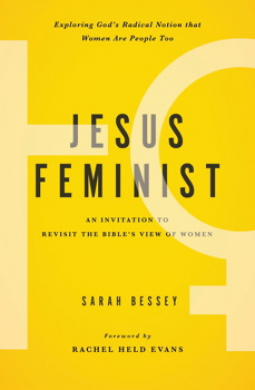 In this book, Sarah reclaims the worth that our Creator instilled in all women. What my Lord sees in me. How much He loves me as much as any other human He created. Sarah weaves her own stories throughout with the Scriptures we know. She kindly challenges the world’s view of feminism. Just as Jesus defended Mary while she sat at His feet, we are challenged to rethink rules we’ve made that contradict the message of His love for us. Jesus Feminist: An Invitation to Revisit the Bible’s View of Women is an inspiring piece that will move, rejuvenate and challenge readers to sink deeper into knowing Christ. My hope is that it will galvanize Christ’s followers as we understand the undeniable worth of women and the purpose God has placed in each of us. You can order Jesus Feminist here! PS: I recently wrote more about being a Jesus Feminist here.